Many houses installed attractive awnings which is also practically protecting your home. In today’s market, there are many varieties of awning to meet different client needs. Awnings supplier provide products from basic window awnings to protect furnishings inside the room to retractable awnings for bigger area shading . To make sure your awnings stay in good condition and works well, regular care and awning maintenance is needed. • If you found stains, take action as soon as possible. Stain such as dirt, bird droppings and any other stains that found on your awnings can easily be clean if you take action immediately. • Brush away the dirt and trash off from your awnings regularly. 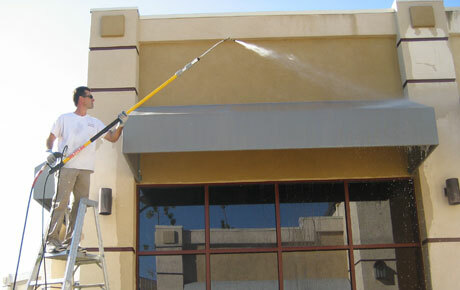 You can use a stiff brush or a broom as the equipment to clean your awnings. • Clean your awnings anytime you noticed the sign of dust increasing. The dirt can turn into mildew if you did not take action instantly. • Use only water, mild soap and brush to clean your awning. Some awnings come with manual. Check it to see if there is any maintenance recommendation to clean the awnings. • Do not use hot water to clean your awnings to avoid material spoiled by high temperature. Use only cold or lukewarm water. Air dry the awnings after washing. • If you live in a warm and humid environment, a frequent cleaning is needed. Doing regular maintenance inspections of your awnings can assist you to identify and treats the problems with your awnings before it become serious. • Plan a yearly inspection for your awnings. Check your awning frame to find out whether there is any rust or paint dropped off. Apply new paint on the area and rust area. • Keep your frame clean and stay away from dirt to prevent the rusting. You can use a broom to brush off the dirt down from the frame. • If you found any tears and rips on your awning, repair it as soon as possible. Wind and rain can increase the growth of tear rapidly. Giving your awning a proper storage is also as important as regular cleaning and maintenance. • If you live in a four season country, consider of remove your awnings on winter, especially if your area receives lots of snow. This is to make sure your awnings do not carry heavy weight, so that your awning can use for longer period. • Before storing your awnings, make sure it is clean to avoid mildew growing. Store it in a dry location for further protection. By giving regular care and maintenance, your awnings can serve you for many years. It is easy to keep your awning clean and maintain it once a year. If you have no idea on how to maintain your awnings, consult your dealer for better solution. You can now enjoy your time under the awning and keep your furniture safe from damage by weather. Posted in awning on July 30, 2014 by Simple Internet.